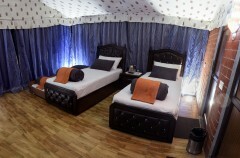 This Rishikesh camping experience is a quaint and peaceful adventure in the high mountains of Uttarakhand. 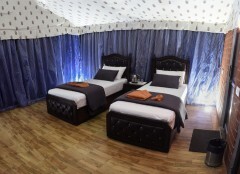 Stay the night in Swiss-style tents pitched just a short walk away from the river. At the campsite, you can go on short nature treks or visit the beach or a nearby waterfall. 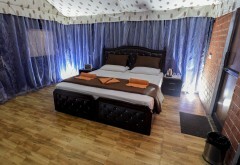 Alternatively, you can also book a rafting or bungee jumping adventure in the city at an extra cost. 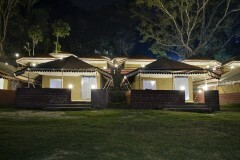 In the evening, you'll gather around the bonfire and enjoy the star-studded night skies of Rishikesh. Located to give you amazing views of the green mountain ranges of Uttarakhand, a night at the campsite ensures a fitting close to a day spent outdoors in adventures across Rishikesh. 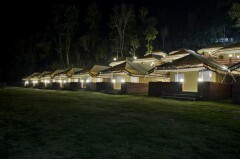 Far from the city lights of Rishikesh, your campsite is nestled in the village of Bairagarh. 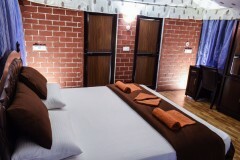 The location is perfect to ensure a holiday steeped in the natural delights of pine-forested mountains, while at the same time ensuring proximity to Rishikesh, located a short 20-km drive from the campsite. You stay in Swiss-style tents that come with an attached washroom, comfortable bed and blankets along a cupboard and table. Your meal plan includes a breakfast at the campsite, which comes with a multi-cuisine restaurant should you wish to have additional meals. • Stay in Swiss-style tents pitched near the river. • Go on short nature treks and visit a waterfall or the beach. 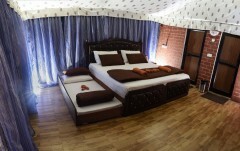 • Catch great views of rolling mountain hills near Rishikesh. Arrive and check-in to the campsite by 12:00 hrs. You can spend the rest of the day at leisure. Take a walk along the campsite to explore the area, or head out to Rishikesh to explore the city. Alternatively, you can also take a tour of the villages, go on short nature treks, visit the beach or engage your group with a game of volleyball or badminton. At an additional cost, you can also book a rafting or bungee jumping adventure in Rishikesh. In the evening, you'll gather around a bonfire, subject to proper weather conditions. 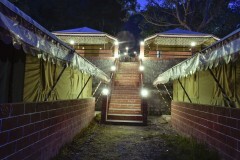 Overnight in Swiss-style tents at Rishikesh. Stay in Swiss-tents pitched just a short walk away from the river. The best way to reach Rishikesh is via flight through the Jolly Grant Airport in Dehradun, 35 kms from Rishikesh. 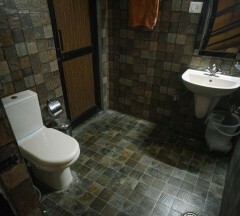 You may board an flight to the airport and travel to the campsite via a private cab/taxi.